One of my favorite things to do when we head up north to our cabin is to collect decorating items that Mother Nature has given us. Especially with Fall right around the corner. And lets face it, going into the woods is fun and just makes you happy and relaxed. I had some time to myself and the keys to the Polaris so, off I went to see what Mother Natures Store has available to decorate with and use in some DIY projects!
. First stop was at a big oak tree to gather acorns. Let me tell you, stooping over and picking up acorns for about 30-40 minutes is not a fun thing on your back! Next up was to find some birch bark from a dead fallen tree. If you go to gather any birch bark, PLEASE find a fallen tree. They are everywhere. Do NOT pull the bark off the live trees. Even though it is curling, it is still growing and it could damage the tree if you peel it. Next I wanted some good size rocks so, I took off down a dirt road and found exactly what I was looking for. I gather about 30 rocks. I might have to get more at some time but, they are easy to get to. Got my acorns and rocks. Next up was gathering some pinecones. These are everywhere even right outside our trailer. They fall on the roof of our trailer and awning continuously. I also got a few branches of oak leaves. The trees haven’t turned colors yet but, I thought the green leaves would be pretty anyway. Finally I wanted some creepy dead tree limbs. and I found the perfect ones that had the dried moss on them. Perfect! Okay, I think I gathered all the things I planned to get on this trip up north. Next trip will be different things. You will see the fun things I am doing with all these treasures in upcoming posts! 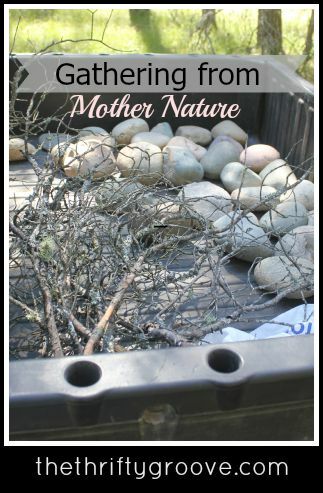 Do you go out and gather items that Mother Nature supplies for decorating? I hope you enjoyed your visit to TTG today. I appreciate you stopping by! Have a great day! I gather pinecones sometimes. I can't wait to see what you do with all that! Fun!! Yes. Pinecones, acorns, leaves, pods and dry flowers. I can't wait to see what you created!!! I cannot resist picking up pinecones, whether I need them for a craft or not! I also cannot resist picking up the colored leaves, especially red. I wax them and just scatter them around my house. You found lots of goodies. I am intrigued as to what you are going to do with the rocks! I have no place to gather much of this. Don't know where I would get the rocks! Could find some birch and also pine cones! Like AnnMarie, I am anxious to see what you do with them.